Share the post "Album review: ACQUA FRAGILE – A New Chant"
Italy does progressive rock very well even if the indigenous talent struggled to broach export markets until front-runners Premiata Forneria Marconi (PFM) got picked up in 1973 by Emerson Lake & Palmer’s vanity label Manticore with ‘Photos of Ghosts’. Bernardo Lanzetti worked vocal duties with the band between 1975 and ’77 prior to which he had fronted this, albeit second-tier, highly effective prog peer. 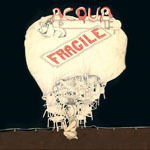 Acqua Fragile’s back catalogue has been doing the rounds of late and for many genre fans the resurrection has constituted their initial introduction to its music. Clearly, they are sufficient in number to prompt the band’s original members out of their lairs to record this set a mere 44 years later. So … sharp intake of breath – does it all work? Most resoundingly Si! it works very well. The fact is the trio has done a great job of generating an entirely new album that dovetails with its predecessors without being self-reverencing or lazily borrowing from the past. Catchy guitar/keyboard-driven compositions are sprightly in form, rich in disposition (even if Lanzetti’s tremolo can veer to the operatic on occasion), enhanced by swathes of synth and strings and glockenspiel (even! ).